Search Growth Slows In The U.S.
Are the search industry’s best days behind it? The growth in the number of U.S. search queries is slowing down dramatically. 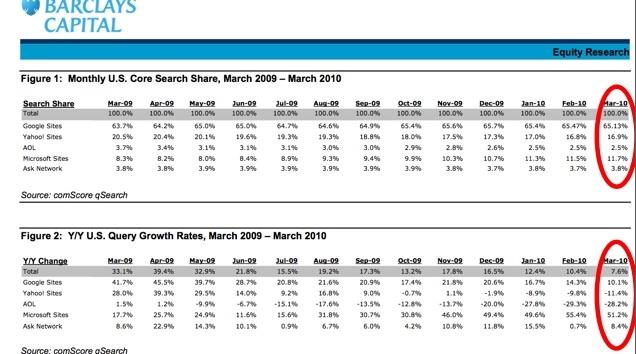 According to the latest numbers from comScore’s qSearch estimates, overall search volume growth slowed down to 7.6 percent in March, 2010 from 10.4 percent growth in February, 2010 and 33.1 percent growth in March, 2009. 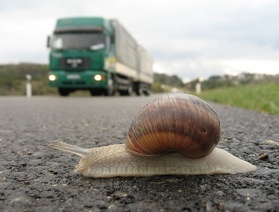 Part of the reason for the slowdown is “partly due to challenging comps” which will continue through May, writes Barclays Capital Internet analyst Douglas Anmuth. But the slowdown may also be an indication that the search industry is maturing, and the next leg of growth may not kick in until people start searching on their mobile phones in a significant way (Steve Jobs says that won’t happen) or something else gives people a reason to search even more than they already do. There are only so many searches you can do in a day, and many people are already hitting their saturation point. Even though overall search growth is declining, Bing is still the fastest-growing search engine, with 51 percent growth in March, followed by Google with 10 percent growth. Both our outpacing the market. Yahoo, on the other hand, saw search volume decline 11 percent annually, although it did gain a tenth of a percent share since February. So its declines may be stabilizing. The table below shows the market share for each of the five largest search engines in the U.S., along with their monthe-over-month and year-over-year changes. Google actually dropped 0.3 percent from February, 2010, while Bing and Yahoo together gained as much.